There’s more to the Norwegian massacre than meets the eye. The New York Times, July 23 “Oslo Suspect Wrote of Fear of Islam and Plan for War” reports that the Norwegian gunman was a right-wing Fundamentalist Christian obsessed with multiculturalism and Muslim immigration. My goodness, I’m concerned with multiculturalism and Muslim immigration but I certainly do not condone killing people especially my own countrymen. Such wanton destruction doesn’t make sense for one thing and, to what purpose? But then, how does one understand the motives of a madman? The gunman’s Twitter post is particularly disturbing. He posts, “One person with a belief is equal to the force of 100,000 who have only interests”. This demonstrates again the dangers of belief, particularly fundamentalist belief in any religion. Such belief is a danger not only to the believer being manipulated but obviously to the lives and safety of others. How such a belief led to the senseless slaughter of so many young people may never be known. Note: some of the text is so small I had to zoom to 200% and pause the video to read it. Even more eerie is that I can yet find no argument with that manifesto but, I repeat, I do NOT advocate violence. Check my commentary on Islam in this blogs Home page Category “Islam” with the byline, “everything I know about the history of Islam and why the West is doomed”. Stay tuned as more information comes to light. And if you haven’t watched the video yet, don’t wait. There’s no telling how long it’ll be available. 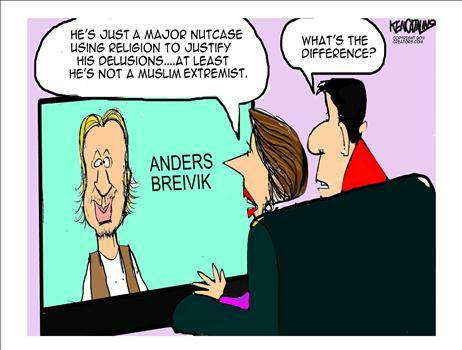 This entry was posted in News & Views and tagged Anders Behring Breivik, Norway massacre. Bookmark the permalink.